Cannabis sativa — the name of the plant species that includes marijuana and industrial hemp — seems to have gone mainstream in modern America. When I was walking through LaGuardia Airport last week for my flight back to Columbus, I passed a shop that featured the above advertisement for cannabis sativa seed oil, as an “herbal fix for problem skin” with “100% naturally derived ingredients.” And Kish and I have been to parties where people our age have knowledgeably and seriously discussed the claimed health benefits of cannabis-infused oils and creams for conditions like sore shoulders and aching backs. For years, people who have pushed for legalization have claimed that the plant could produce many different types of useful products — and now it seems those claims are being realized. If cannabis products are being accepted by the masses for skin care and health care purposes, it’s a pretty good indicator that cannabis has become big business. In America, there aren’t many product areas that are bigger than skin care and health care. Beards seem to be a source of endless fascination for medical researchers and health care reporters. Ever since Peter Griffin grew a beard that served as home to a nest of birds on Family Guy, their prevailing view seems to be that male facial hair must be host to countless forms of microbial life and teeming with potential disease-causing agents. Makes you want to cringe any time you’re in the vicinity of some stranger with a rancid sour milk-scented hairy toilet seat on this face, doesn’t it? So, speaking as a guy who’s had a beard for the last 20 years, it was refreshing to see a new bit of research that counters the notion that beards are germ-ridden potential public health disasters waiting to spread plague and illness throughout the population. A study published in the Journal of Hospital Infection found that clean-shaven men are more than three times more likely to have a challenging form of infection-causing bacteria called MRSA (for methicillin-resistant staph aureus) on their cheeks than bearded guys, and also are more likely to have faces with staphylococcus aureus, which can cause skin and respiratory infections and food poisoning. Why would this be true? Researchers think that those two forms of bacteria might form colonies and breed in the microabrasions caused by men repeatedly scraping their faces with sharp objects (otherwise known as shaving). And, even more intriguing, a separate analysis indicates that beards may be home to microbes that actually kill bacteria, which could lead to the development of new forms to antibiotics — which something that the world desperately needs because bacteria are becoming increasingly resistant to the current array of antibiotics. That’s right: in the space of a single article, beards go from filthy petri dishes of lurking disease to the potential salvations of the human race! I think I’ll celebrate by guzzling some dairy products and letting a few drops find a whiskery home. Richard has a splendid story in today’s Pittsburgh Post-Gazette about the hospital of the future. Appearing on the last day of his internship there, it’s a thought-provoking think piece about what the hospital of the future might look like. I would expect communications technology to change hospitals, as it has changed law firms, retail stores, and just about every other business you can think of. 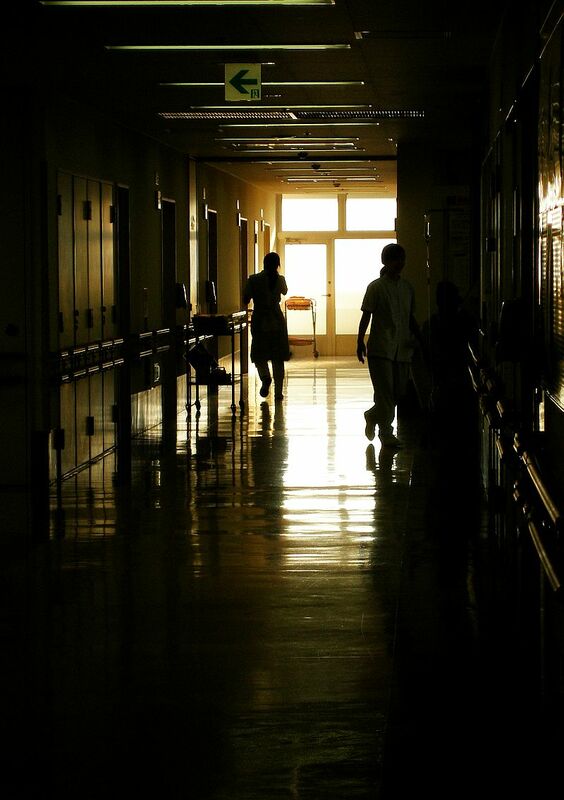 To me, the most interesting part of the piece was about the physical design of hospitals, and specifically how hospitals are striving to make their facilities more inviting and capable of being “branded.” Rather than the institutional, brightly lit corridors most of us know, the new hospitals are warmer, gentler in their design and lighting, and chock full of things like gardens and coffee shops. They’re bound to be less depressing than the sterile, wholly functional designs of the past. In that respect, Richard’s article made me think of colleges, and how their focus has changed from the professor and the classroom and the curriculum to the posh student centers, rec centers, and health clubs that so many schools have built to attract more applicants. We can bemoan the decline of serious scholarship on campus, but colleges clearly have recognized that they are competing for paying students and are willing to build what is needed to attract them. As hospital systems become more competitive for patients — and in Columbus, we’ve got three gigantic ones duking it out — they’re bound to follow suit. Since my surgery yesterday, I’ve kept my left foot elevated above my heart, to try to minimize swelling, and avoided putting any weight on my left foot, to avoid bending the pins that are straightening my toes. 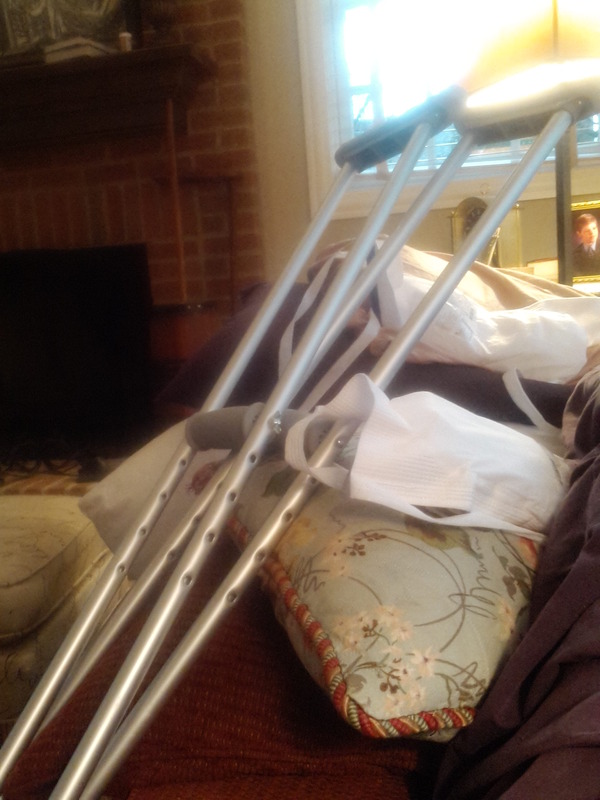 That means I’ve made two new friends — our family room couch and my crutches. In our house, the couch is the province of Kish, Penny, and Kasey; I’m a chair guy. I’m also happy to report that in nearly 32 years of marriage I’ve never slept on the couch before. Last night I broke that record. It’s just easier to stay on the first floor right now, and couches are well-suited to constructing teetering towers of pillows to serve as a platforms for my bandaged hoof. With the aid of some pain medication, I slept pretty well last night, and my main concern is keeping the dogs from jumping up on me. I’ve also been fortunate to never have used crutches before. They’a bit awkward, and I’ve got to watch slipping on the rugs on our hardwood floors, but I’m starting to get the hang of them. I can hobble around, after a fashion. Some time in the distant past, some now anonymous person invented the first crutch. Like the splint, the crutch is one of the basic medical care devices that has been used for millennia; it apparently dates back to ancient Egypt. On behalf of all modern users of this ancient device, I’d like to thank it’s true inventor — whoever you were. Today’s outpatient procedure at the East Side Surgical Center demonstrated the value of a good nurse — and how essential they are in the modern world of healthcare. From the outset, after I completed the registration materials, I was in the realm of nurses. Pre-operation, a friendly nurse adjusted my crutches to the right height, got me changed into surgical garb, took my vitals, created my ID bracelets, gave me my initial medication, and set up the blood vessel portal for the anesthetic to be administered, among other tasks that I wasn’t even aware of thanks to our relaxed conversation. She was a real pro. After the surgery, I awoke to the company of another nurse who checked the dressing on my foot, explained that the operation had gone well, took my blood pressure, gently engaged me in a slow-talking conversation as the anesthetic fog gradually lifted, steadied me on my crutches, then wheeled me out to where Kish was waiting for me with the car. She was great, too. In our penny-pinching health care system, doctors have to focus on doing the high-level procedures for which they are so well trained, and nurses carry the load of performing the other medical, and administrative, and human interaction duties that need to be completed. We can only keep costs under control — and also create an experience where the patients truly feel like they are receiving care — if we have a corps of kind, pleasant, professional nurses who make the system run. I’m happy to report that I received excellent nursing care from some wonderful people at the East Side Surgical Center on my visit this morning. Of course, the best care of all is at home, where Kish is saddled with keeping an eye on me while I’m flat on my back for a few days. My doctor is a big believer in preventative medicine. He’s also a bargain shopper. Even though I have no symptoms of heart problems, he’s been after me to have a heart scan to perform “calcium scoring” and determine whether there are plaque deposits that might cause a problem in the future. When he heard I could have the procedure performed for only $95, he really encouraged it. 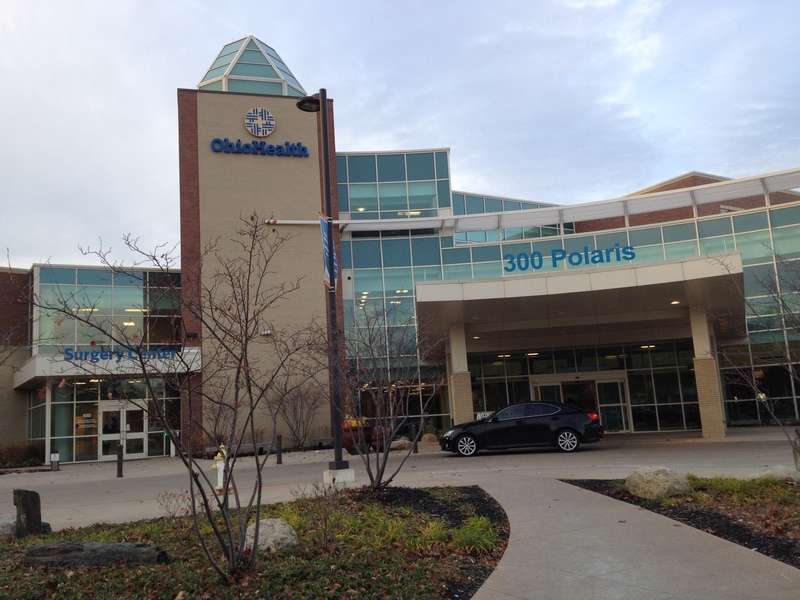 So, yesterday morning I drove to the Ohio Health Westerville medical campus off Polaris Parkway on the north side of Columbus. The facility is in one of those buildings you see around large cities throughout the nation — trim and brick, three stories, spread out, with lots of free parking. I’d made a reservation, so I walked right in to a bright and spacious reception area, paid my $95, filled out a form, and was escorted to a room that featured one big piece of high technology equipment. I stretched out on a platform without having to remove any clothing, a friendly technician attached a few electrodes underneath my shirt, and the machine then moved me back and forth through a spinning circular device and instructed me on when to hold my breath as x-ray pictures of my heart and lungs were taken. 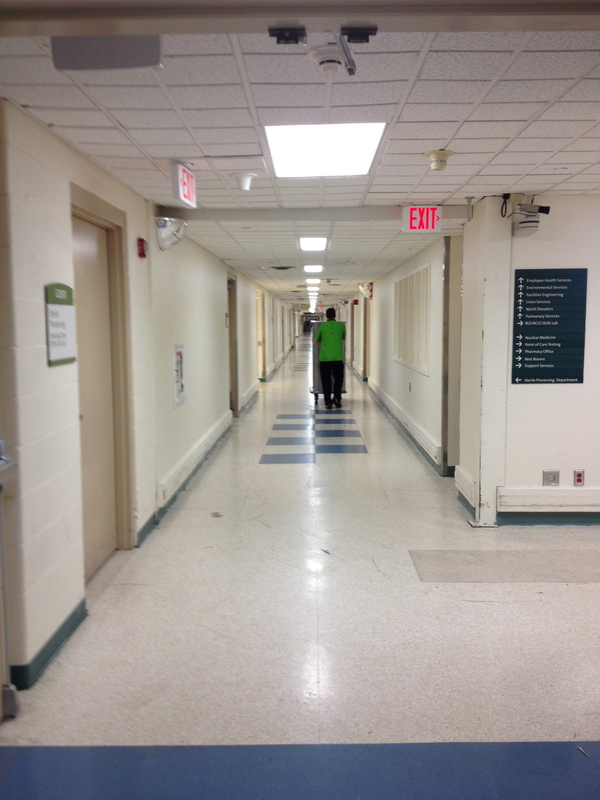 There are ways to hold down health care costs, and this facility is one of them. It’s in an area where land is cheap. It offers a few services — I saw an emergency room, a surgery center, and the x-ray and scanning suite as I walked in — but doesn’t try to provide every form of care that a person might possibly need. It competes with other providers, which helps to keep costs down. In Columbus, there are dozens of these little pocket hospitals where you can go to have a scan, a colonoscopy, or arthroscopic surgery on your elbow, among other forms of routine health care activities. The pocket hospitals employ hundreds of doctors, nurses, technicians, receptionists, and other staffers. Yesterday the whole process took about 20 minutes from start to finish, and then I was out the door and headed to work. It was cheap, easy, and convenient. How often do you end up saying that after your encounters with the American health care system? Another area in which the Affordable Care Act will have an impact on health care in America is beginning to get some attention. It has to do with the “provider networks” — that is, the collection of doctors, hospitals, and other health care facilities and personnel being offered by some of the new insurance plans. The Affordable Care Act posed some difficult challenges for insurers. Under the statute, they were required to include a number of new, mandatory forms of coverage in their health care plans. That requirement, obviously, limited the ability of insurers to control the costs of particular plans by tailoring the kinds of care covered by those plans. But the insurers still need to figure out a way to control costs, because their plans need to be competitively priced. There aren’t a lot of remaining cost-control options. One is to tinker with things like co-payments and deductibles and increase the non-premium payments that the insureds must make when they use health care. Another is to limit the networks to particular health care providers who, due to location or contractual agreement or some other consideration, are offering health care at lower prices than their competitors. That’s the gist of an article in the Wall Street Journal by a cancer patient whose existing policy has been canceled and who can’t find a substitute policy that includes all of the providers that have given her the unique combination of care that has allowed her to beat the odds and survive. It’s an indication of the kind of long-term effects that will play out over time, as the Affordable Care Act reshapes the health care market. In the individual market, at least, Americans who are used to going to whichever doctor and hospital they choose may need to change their habits — and they probably won’t be very happy about it.